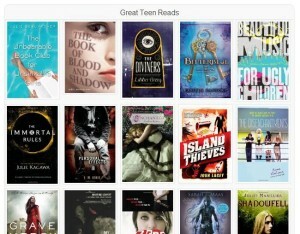 Since I’m in no way an expert on YA titles, IÂ wanted an easy way to add titles that appear on the many booklistsÂ available from different sources. Â But also wanted something thatÂ had some graphic appeal. Since it’s a statewide site, I couldn’t pull a list of covers from a library catalog and link directly back to the titles. It’s easy enough to build your own widget, but if you want to use ours,Â here’s the code you can use to embed it on your own website. If you have suggestions for the booklist or the booktrailers widgets, let me know. Â Maybe I’ll spend my summer vacation reading YA lit? What do you suggest? Is there a way to change the links to our local catalog instead of librarything? I think there should be…. right?